Update: Live version of the song (with subtitles) added below. Who says tango always has to be sad? Sure, it is melancholic music in general, but its lyricists covered a variety of topics and some orchestras, like Canaro’s, included more ‘cheerful’ songs than others. Like I wrote last time: there’s more to tango than broken hearts and autumn rain, and this time we will look at a more ‘uplifting’ aspect of love… something I won’t spoil for you now, better just find out for yourself below. However, tango wouldn’t be tango without a slight hidden edge of melancholy, but again, I prefer you find out in this lyric yourself, or maybe disagree… comments are welcome. hecha carne por milagro de la vida. ¡En momentos en que mi alma estaba herida! con sus luces mi destino iluminó. todo es alegría, un canto al amor. and miraculously became a woman. her shining light lit my path. everything is joy, an ode to love. revive la fe, florece la ilusión. la vida es gozar y el vivir querer. amar a una mujer eso es vivir. your faith is restored, your hope revived. life is a delight and to live is to love. loving a woman, now that’s real living! de un beso de ternura angelical. by a kiss of angelic tenderness. Lomuto sounds relatively cheerful for a tango orchestra, especially with the distinctly optimistic voice of Jorge Omar. There is also a slightly more melancholic, yet energetic Canaro version of this song, which includes the first part between the brackets below. Both versions are interesting. The text itself is not cheerful at all. amarga, tonta y sin razón. de las cosas de la vida. with such bitter, stupid and pointless worry. because I was always laughing away life’s problems. esta verdad que es mi dolor. you would suffer like me. 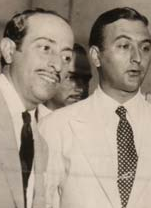 Roberto Chanel (white suit), with Pugliese (below, glasses) signing a contract. me hablan de tu gran amor. my memories tell me of your great love. and in the bad, much more still. cómo envenena esta pena de perderte. si te llevo en el adiós. the last dice of my destiny has been thrown. how poisoning is this agony of losing you! as I carry you within my farewell? tu presencia es como un sol. your presence is like the sun. Nada más: one of the most passionate and desperate tango lyrics ever. We have the luxury of several interesting recordings, especially the immortal dance version (with limited singing, the second part) recorded by Juan D’Arienzo in 1938. This poem is so powerful that I wanted to translate the full text, as sung by the incredibly emphatic Ada Falcón, who was abandoned herself by Francisco Canaro. The first line of the second part is the best phrase I have ever heard in tango. Pure class! frente a frente con la vida. porque sin vos no he de saber vivir. será mi vida una cruz. face to face with life. because without you, I cannot live. ¡Cuánta nieve habrá en mi vida! llenaré de brumas mi alma. without the fire of your eyes! will lay down and die. I shall fill my soul with darkness. que la mentira de tu amor como limosna. con el vacío de mi decepción? pero, por Dios, no me dejes. with the void of my disillusion? but, for God’s sake, don’t abandon me. thrown away into some corner. *Literally: ”my life will be a cross”, referring to Jesus’ suffering, a metaphor repeated in the second part. **In the original poem, the intended word seems to have been ”cloud”, but Alberto Echagüe sings ”die” instead. ***More literally, ”your love as an alm”, a beggar’s alm.